Recent graduates who strongly agree with any of three items measuring supportive relationships with professors or mentors are almost twice as likely to strongly agree that their education was worth the cost. These relationships hold even when controlling for personality characteristics and other variables such as student loan debt and employment status that could also be related to graduates’ perceptions that college was worth it. If recent graduates strongly agree that they had any of three experiential learning opportunities—an internship related to their studies, active involvement in extracurricular activities or a project that took a semester or more to complete—their odds that they strongly agree that their education was worth the cost increase by 1.5 times. However, whether recent graduates participated in a research project with a professor or faculty member is unrelated to their opinion that their education was worth the investment. This finding suggests that it is important to assess the quality of faculty members’ interactions with students—and the benefits students derived from them—rather than simply tracking participation in such projects. I found the third point above particularly worrisome, as we don’t have ways for really checking the quality of the interactions in things like thesis projects—we count on the goodwill of the faculty involved to make the experience a good one. We are also short on internships, though most of the BSoE majors now have multi-quarter projects for the capstones. I had a mentor who encouraged me to pursue my goals. … programs such as those that recruit alumni as mentors do not need to be costly, but they can make a powerful difference in more effectively engaging both students and alumni. They did note that modest amounts of debt (up to about $25,000) did not seem to reduce alumni satisfaction, but larger amounts of debt seriously reduced whether alumni thought their college experience was worth the price. There wasn’t much difference between public and private, non-profit colleges, but the for-profit colleges were much less appreciated by alumni. Also in-state or out-of-state public university did not seem to result in different distributions of satisfaction with the value of the education (despite the fairly large difference in price), and research universities followed the same distribution as public and non-profit private colleges. Only the for-profits stood out as distinctly different (possibly related to the high debt load—I didn’t see an analysis of the for-profits that controlled for debt—maybe there were too few low-debt students at the for-profits to be statistically significant). I soldered the components to the prototype board first this time, then added the wires, rather than trying to do both at once. As before, the end with a one screw connector is the 12V input, and the other end has a pair of GND connections and a pair of 5V connections. The circuit is the same as before, with the addition of a green LED to light up when there is power. I tested the regulator with 1, 2, 3, and 4 of the fans: http://www.digikey.com/product-detail/en/FAD1-06025BBLW12/Q620-ND/2600074 I got a constant 5.02V output independent of the load when powering the regulator from a 9.25V power supply (nominally 9V). The 9V supply is pretty beefy (6A capability), so the tiny loads of the fans did not cause much change in the voltage at the input to the regulator (maybe 0.02v IR drop). It seems like the voltage regulator works fine as long as the input voltage is at least 7V (as claimed in the specs), but if the IR drop in the wiring to regulator is enough to drop the voltage below 6.8V, the regulator may not be able to supply enough current to start the fan motors. Each fan takes about 80mA@5V (400mW) once up to speed, so the regulator seems to have an efficiency around 74%—considerably less than what I expected from the spec sheet. I’ll have to investigate that more closely. I have a crawl space under my house that gets rather damp—my house is built where an aquifer comes to the surface, and in most years the water table is only a few centimeters below the surface. (Because of the 4-year drought, the water table is currently about a 30cm below the surface.) A few years back I had a solar panel put on one side of the house, connected to 12V fans in the crawl space to exhaust air from the wettest part of the space, but the fans stopped working shortly after the installation. The 12V DC wires from the solar panel to the fans were broken somewhere, and so there is no voltage at the fans. The voltage from the solar panel exceeded the voltage rating of the fans enough to burn out the fans. I’m claustrophobic enough that I’ve never wanted to crawl around down there to try to debug the problem or replace the fans, so the installation has been non-functional for a few years. So next week I’m having my general contractor/carpenter redo the fans so that they will be more maintainable. The main thing is to make hinged “doors” for the vents, so that the fans can be accessed from outside the house, without having to crawl the width of the house under a very low ceiling. Having access to both ends of the cables also makes checking them for continuity easier, and makes it possible to pull new cables if needed without crawling under the house. I’m also going to change how the fans are hooked up. Instead of using 12V fans, I got a number of little 5V fans that are very quiet (18.1 dB) but have reasonable airflow (13.1 CFM): http://www.digikey.com/product-detail/en/FAD1-06025BBLW12/Q620-ND/2600074 They are rated for 70,000 hours, but are only rated down to –10°C (good enough for Santa Cruz). Putting 4 of the little fans blowing air through holes in the “door” should provide me with about 50 CFM (cubic feet per minute) at about 24dB. With two such doors (8 fans) I should get 100CFM at about 27dB. That is more air flow for the noise level than any single-fan solution that I found. I also don’t have to worry about the IR drop in the cabling to the vent fans, as it will not be anywhere near enough to drop the voltage below 7V when the solar panel is producing power. The Schottky diode is there to prevent damage from accidentally wiring the power backwards—I happened to have a couple on hand. My soldering is pretty sloppy on the prototyping board—I’ve gotten so used to doing custom PC boards for everything that running wires and joining them to components seems a bit strange. 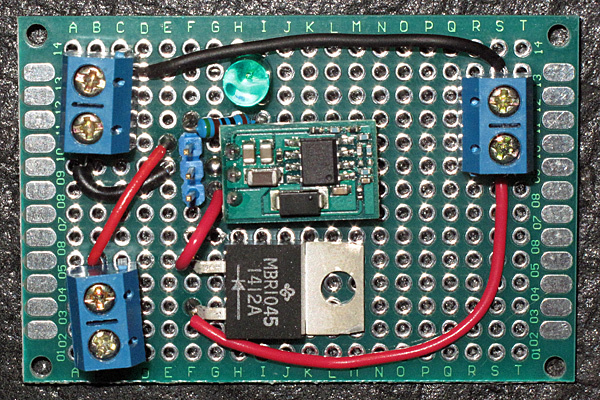 There’s not much point to a custom board for only 2 instances, though, especially with such a simple circuit. In this rather low-quality photo, the 12V input (7V–36V) comes in through the two screw terminal on the right, and the 5V output is on the the two front screw terminals on the left, with ground on the two back screw terminals on the left. I added male headers for +5V, Gnd, Vin, so that I could later add monitoring circuitry for remote monitoring or logging the voltages, if I felt like adding that. It might be interesting to log the voltages for a year. I’m considering adding a resistor and an LED to the 5V output, so that there will be a visible indicator of power, but I’m not sure it will be worth the effort, since the board will usually not be visible and if I open the panel for debugging, I can use a voltmeter easily enough. A new board in the Teensy series, the Teensy 3.2, has just been released. 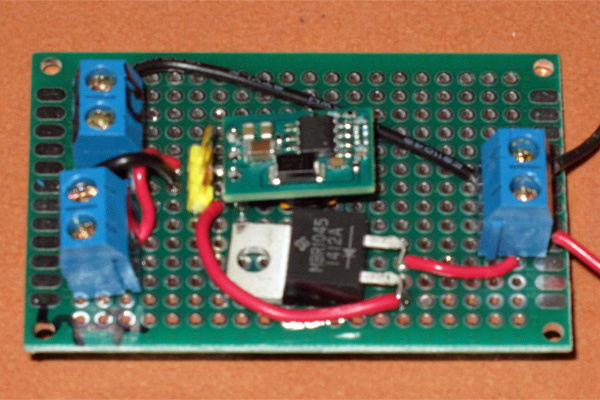 It is almost identical to the Teensy 3.1, but has a better 3.3V regulator, so that more 3.3V power can be used by peripherals. We’ll have to make some tiny changes to the PteroDAQ data acquisition system so that it will recognize the Teensy 3.2, but nothing major, as it will use exactly the same code as the Teensy 3.1. I’ll have to reinstall the Teensyduino development system and find out how (or whether) it distinguishes between the boards. The addition of the voltage regulator is a substantial improvement to the board, allowing about 500mA of current on the 3.3V line, rather than the 100mA limit of the Teensy 3.1. I still think I’ll recommend the Teensy LC for the electronics class, as a somewhat better price/performance ratio for the needs of the class, but the Teensy 3.2 is a good choice if you need a little more processing speed or the more complex DMA capabilities. I was getting a rather annoying amount of 60Hz hum, probably from the microphone preamplifier. I’ll have to play with it a bit tomorrow to see if I can avoid the hum pickup. It turned out to be a fairly simple, but unexpected problem. The TLC3702 comparator chip has 2 comparators in the package, and I had not connected anything to the second comparator. Connecting the inputs to ground eliminated the hum! I think that what was happening was that 60Hz pickup on the unconnected input was causing the second comparator to swing back and forth at about 60Hz, and that this was coupled internally to the comparator I was using (probably through the shared power connections). By silencing the second comparator, I removed this source of hum. My son also noticed a high-pitched noise that was barely audible to me. I figured that the source was probably the low-quality triangle wave from the FG085 function generator. If the period is not an exact multiple of 250ns, then the sampling of the triangle wave gradually shifts phase, and that changing phase turns into a PWM signal that is audible on the speaker. By selecting 62.5kHZ, exactly 64 clock pulses of the FG085 clock, as my PWM frequency, I avoided phase shifts and eliminated the high-pitched whine.